one of Maryland 's largest hardwood floor contractors. For Tim DiPaula it all started in the late 1970s. DiPaula's company, Lady Baltimore, today enjoys revenues of "more than a couple million a year" from installing and maintaining hardwood floors in some of the area's ritziest homes. But it started with an assignment in a community college marketing class. And a ruined hardwood floor. 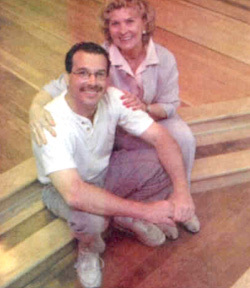 "Back in 1979, I had a project in my marketing class at Catonsville Community College to write a business plan for starting a business with the least amount of capital," recalls DiPaula, 38, whose company on most days has a dozen two-man crews scattered out across several counties, installing, sanding, staining and restoring hard-wood floors. "My mom and step-dad had a company back then, which later went belly-up," he adds. "They got involved in the project with me. We thought of starting a cleaning business. All you need is a bucket and a bunch of rags and you're ready to go. Soon, DiPaula formed a partnership with his mother, Chris DiPaula, now 68, and put his plan into action. She ran their fledgling cleaning busi- ness out of the basement of their Reisterstown home and he went out and did the cleaning. Shortly thereafter came the ruined floor. "Well," he rolls his eyes sheepishly, "I destroyed the lady's floor. I had to bring in a con tractor and pay him to finish it. That struck a nerve with me. I had to learn to do it right." So DiPaula attended a seven-day, hands-on training class in Georgia that was sponsored by the National Wood Flooring Association, then he borrowed the money to buy a, top-of-the-line, $5,200 floor sander. Mind you, DiPaula insists, there are Lots of people who sand hardwood floors, but there are very few for-real floor sanders. He says it takes several years of training and apprenticeship before he's ready to turn one of his sanders loose on an antique heart pine or mahogany floor in a suburban mansion belonging to Sugar Ray Leonard or Lynda Carter (He's installed or fixed floor's in the homes of both celebrities.) And when he speaks about the craft he grows intense and describes the same elusive quest for perfection that a professional athlete might refer to in a discussion of his or her earned run average or golf handicap. "It's an art - a dying trade," DiPaula says. "The way I explain it is that it's like landing and taking off with an airplane. It just involves a lot of touch. A lot of feel. "The big problem is, if you do it wrong you don't see the imperfections until you put on the stain or polyurethane. Then it's too late." Jonathan Herman, mayor of the Carroll County town of Sykesville and owner of Herman Construction Inc., has seen first-hand the intensity DiPaula can bring to a project. The two worked together from time to time, restoring historic properties in Carroll County and elsewhere. That was back when Lady Baltimore was still small enough that DiPaula was still doing most of his own sanding and finishing. "Though I haven't worked with him very much since his company got so big, Tim's a wonderful guy to work with. I like him a lot," says Herman. "I know, when he's focused on a project one-on-one, it gets done and it gets done well." Looking back, DiPaula said that even after he botched that first hardwood floor, then took the course in Georgia , it still took him a couple years of sanding two or three floors a day - "in apartment complexes. where it didn't have to be perfect" - before he really got his sanding licks down. But he insists that for those who do have the perseverance and deft touch required for mastering this -"dying trade," and for those suffer the inevitable toll it takes on the back and knees, after a decade or so, there's a pay-off. "Some of my best sanders can make upwards of $65,000 a year, and some of my installers make well over $ 100,000 a year," he says. "And they're usually finished by 3:30 in the afternoon. But, it does take a physical toll on you after while, like playing football." DiPaula seems a tad wistful that the demands of running his 30 or so-employee business with his partner Rick Bryant (who came on board about six years ago when his mother retired) leaves him little time to practice his art anymore. These days he spends most of his 65 or more weekly working hours in his office-showroom, a spacious restored barn just off northern Main Street in Reisterstown. The showroom is a veritable library of hardwood floor samples, both plain and fancy - from lovely but standard issue maple flooring to $15-a-square-foot antique' heart pine. If money really is no limit, you can even get exquisite hardwood medallion tiles inlaid in ornate patterns and scrolls rendered from a half-dozen different species and colors of wood. These go for a mere $100 or so for a single a square-foot section. Or about $4,000 or so for a standard 20- by 20-foot living room floor. "I've only got a little bit of that in my house,, around the fireplaces," admits DiPaula, who lives with his wife and kids in a 150-year-old Carroll County farmhouse that he restored. DiPaula seems to take just as much pride in the opportunities that Lady Baltimore has opened up for some of his friends as he does in the growth of the company itself. "I hired my first employee, Dan Warren, in 1980," he says. "He's still with me. I've been blessed with a wonderful crew of guys, and in the beginning we all teamed together." And though DiPaula's mom, who is recuperating from a recent heart attack, is no longer active in the daily business, he says she's still there behind the scenes. "We're. very close," he says. "If I have a problem or need some guidance on some aspect of the business, I'll always go see her and we'll spend hours sitting around the dining. room table, figuring out a plan. "Mom and I have really lived out our own American dream," DiPaula adds softly. "There really has been the hand of God in all this."